IUKL Alumni!! This is your call to make the next move! 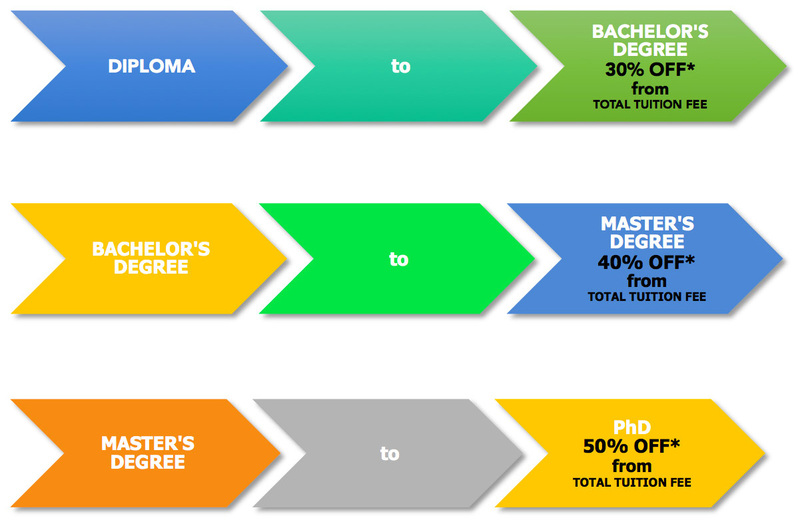 Further your study to the next level at IUKL and earn up to 50% DISCOUNT* on your tuition fee. Student will get a discount of 30%, 40% and 50% respectively according to their level of studies. The discounts will be given based on the TOTAL TUITION FEES. Who are entitled to get this discount? All IUKL Alumni progressing to the next level of study (excluding Foundation students). This is an auto-application for all IUKL alumni. No form is required. Am I entitled for other promo/discounts from IUKL besides this scheme? No. Once you accept this scheme, you will not be eligible to apply for other promotions or discounts such as tuition fee waiver offered by IUKL. What else should I take note for?